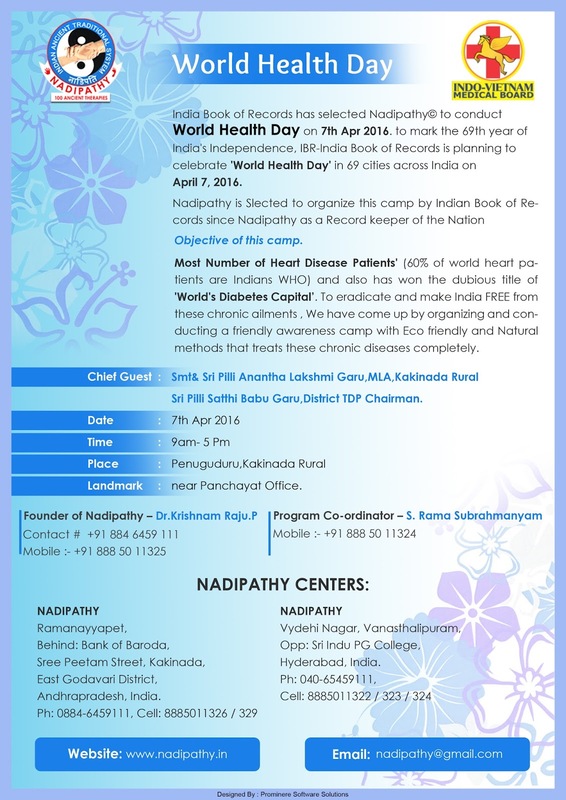 India Book of Records has selected Nadipathy© to conduct World Health Day on 7th Apr2016. to mark the 69th year of India's Independence, IBR-India Book of Records is planning to celebrate 'World Health Day' in 69 cities across India on April 7, 2016. Most Number of Heart Disease Patients' (60% of world heart patients are Indians - WHO) and also has won the dubious title of 'World's Diabetes Capital’. To eradicate and make India FREE from these chronic ailments, We have come up by organizing and conducting a friendly awareness camp with Eco friendly and Natural methods that treats these chronic diseases completely.